Monday (the 17th) was Syttende Mai, Norway’s Constitution Day. It’s like the Norwegian version of the Fourth of July, except that it’s a waaaaaaay bigger deal. Norwegians are ferociously patriotic, doncha know. It’s a day when, as a kid (or even adult), you’re allowed to eat all your favorite foods – even ice cream and hot dogs for breakfast! There is a parade in every town with the children and the teachers marching in front of the capital buildings (in Oslo you get to wave to the King and Queen!). And, everyone turns out waving their flags, and dressed in traditional woolen embroidered costumes called bunads. You sing songs and have parties with neighbors and generally have a grand ole’ time (and if you’re partying in true Norwegian fashion, you also usually get totally wasted, but we won’t go there). This, kind of amazingly, was the first Syttende Mai I’ve had when I haven’t gone to celebrate with my family. Luckily, a wonderful band of my friends were willing to come over and parade with me around my neighborhood, sing songs (we even had guitars and mandolin), hear troll stories, and eat all the traditional food I prepared. I took the day off of working and just stayed home and cooked! We had a whole smorgasbord of treats from hotdogs, meatballs, red cabbage, and smoked fish, to boller, sour cream porridge, whipped cream cake, and vafler. Trying to choose which of these foods is my favorite would be like trying to choose a favorite child (er, if I had children). 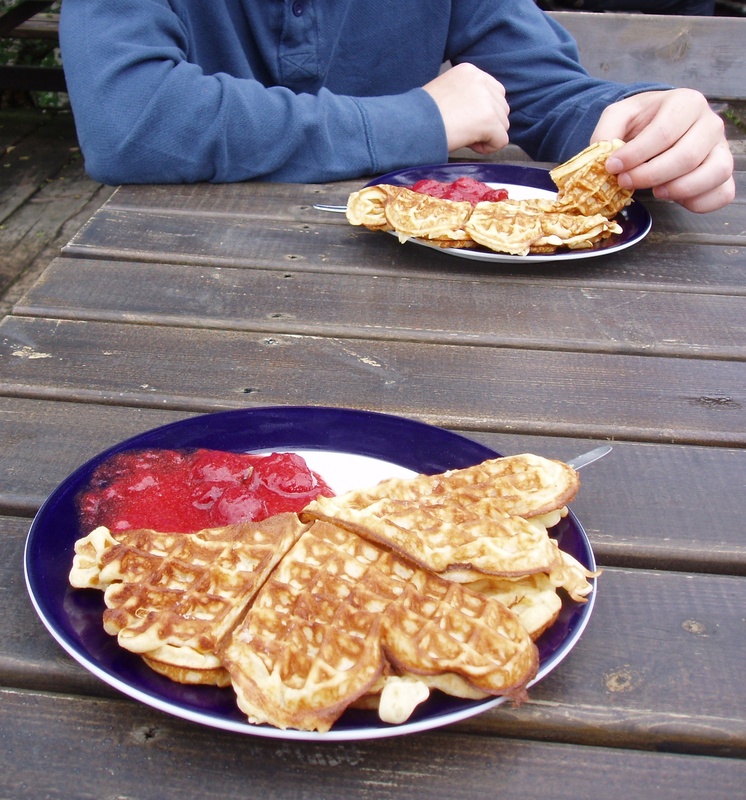 But, I’m going to share a recipe for vafler, Norwegian heart shaped waffles, with you because they’re just so iconic. If there were to be an ‘ultimate Norwegian snack food smack down’, I’d pit vafler against boller, and honestly I have no idea who would win. Both are beyond delicious, and you find them all over the place. You can get freshly made waffles in many cafes across the country, served plain with butter, or with jam and sour cream. They’re heaven with a cup of coffee. Sometimes in the summer, kids will even make waffles and sell them at stands – kind of like a lemonade stand. Trying to walk past the scent of waffles being freshly griddled without buying one to eat is like torture. It’s a fabulous business ploy. I’d say pretty much every household in Norway has its own waffle recipe. Some are airier and crispier, some are eggier and heartier. They’re all delicious, I’d bet. They’re thinner, and chewier, and oh so much better than any Belgian waffle you’ll come across, in my humble opinion. My recipe is yet another taught to me by my mother with instructions to add “a bit of this, a dash of that, a few other things if you happen to have them, and then whisk in milk until it looks right.” And, I’m afraid I haven’t yet bothered to measure and exactly pin down a recipe, but here is my best approximation! Also, to everyone who doesn’t have a heart waffler, I’m sorry, and I usually am really opposed to cooking that requires special equipment. But, I make exceptions for particularly important foods, and this is definitely one of them. butter, jam, sour cream, for serving. In a large bowl, thoroughly whisk together the ingredients from eggs through baking soda (this can be done by hand, or in a standing mixer). Then, whisk in the milk a bit at a time to make a smooth batter. Set aside and allow to rest for about half an hour before cooking. 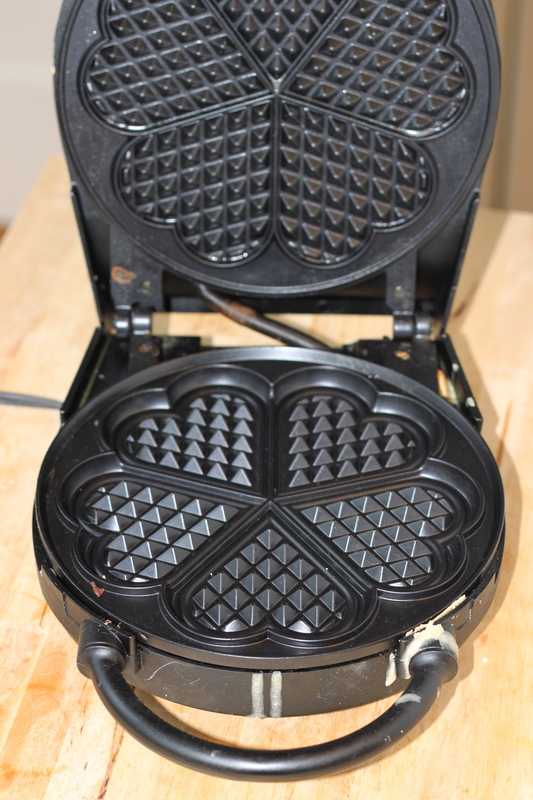 Heat your waffler iron to high. Stir the melted butter into the waffler batter. Cook the batter in the iron about ¾ cup at a time (so that the iron is just full but not overflowing), until each waffle is golden brown (no clue how long this actually takes – I just go by sight, opening the iron and peeking in after a few minutes. Butter the waffle iron as needed during the cooking process. Transfer done waffles to a cooling rack so they don’t get soggy. Serve in little sets of two hearts to make sandwiches, or as whole rounds, with butter or jam (and sour cream or whipped cream if you wish). Vafler are by far the best when they’re warm and fresh off the waffle iron. But, you can also allow them to cool on a cooling rack, and they keep for a day or two refrigerated and you can reheat them as desired in a toaster oven. Hey Emily. They even sell them at gas stations here in Norway now, with geitost if you want. Haha! I figured that would start one of these days. Norwegian waffles, or vaffler, are truly special. It’s always fun to see Norwegian recipes on other blogs. Thanks for sharing! 🙂 You make a very good point! Neither one is more important – and Norway only managed to make itself independent from Denmark, which overall seems much less impressive than gaining independence from the British empire! ;)- they are just different. I just get a little overexcited about the 17th because it’s one of my favorite days of the year. The parades in your neighborhoods on the 4th sounds like great fun! I wish we had that where I live. Boston does have some nice fireworks, though. Yikes Melinda, why so defensive? It sounds to me as though Emily is just excited about a national holiday. Your response seemed so defensive and sour. Lighten up – we’re all enthused about our heritage. Emily, when I was a young girl a friend of my parents was from Norway. 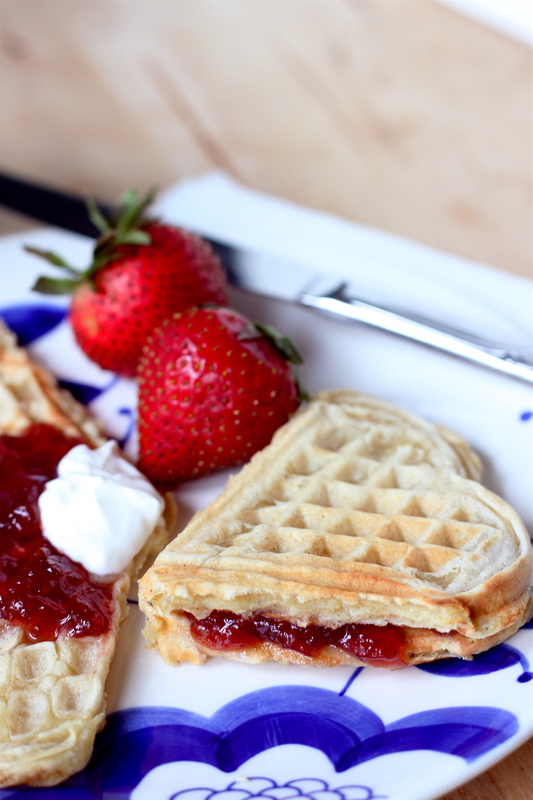 For a picnic one summer she brought the most DELICIOUS dessert of waffles spread with jam. I have tried for the last 35 years to duplicate her recipe but always seemed disappointed in the end result. I cannot WAIT to try your recipe – my mouth is already watering. Happy 17.mai to you! I am 1/4 Norwegian, but unfortunately, my Norwegian grandmother died when I was very small. I didn’t know anything about 17.mai until today, but I am going to celebrate and make some of your vaffler tonight! Thank you! Happy 17 mai to you too! I hope you enjoy the waffles. Have a wonderful celebration! I used to live in the tri-border area of Germany, with the Netherlands and Belgium close by. Oddly enough, it was there that I was introduced to the Norwegian Waffle. And I have to say, out of the Belgium Waffles, The Dutch pannekoeken, and several other German treats, (even including a crepe here or there) the Norwegian waffle is still my favorite! I loved this blog post explaining a bit more about the waffle and about 17 Mai! Thanks for posting! Oh, and I don’t think that unless one has lived in a European country, that a person might not understand exactly what you meant about a holiday being a big deal in Europe. I just had no way to explain to all my relatives (in America and who have never been outside of America) that our national holidays just don’t compare to how they celebrate in Europe. The only thing that comes close is Christmas. Yay! Glad to hear you have such good taste in waffles, teehee ;). And, you’ve captured exactly the difficulty with explaining European national holidays! There’s just nothing to compare it to that’s quite right. Tusen takk!!! 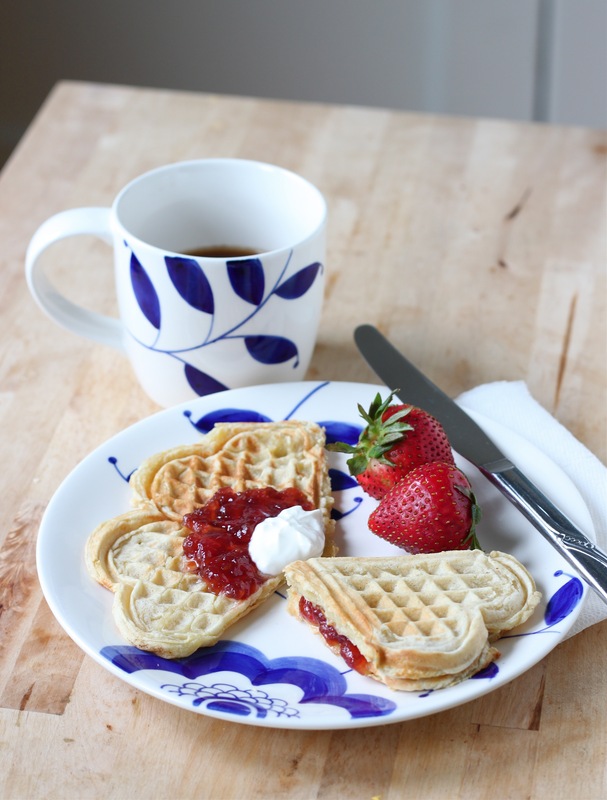 I received a heart-shaped waffle maker for Christmas after raving about these waffles when I moved back to the US from Norway…now I can make them properly for everyone! Vaer saa god! 🙂 I hope you like the recipe! Heisann. Thanks for the recipe but I am kind of confuse how much is one cup, Kan du fortell meg vær så snill? Jeg bor i Mongolia, so I make them to everybody and it is very popular. Takk takk takk! The commentary to the recipe is light hearted and written with good intentions, does not demean anything or anyone and left me smiling, if not chuckling a little. Unlike the unwanted US history lesson posted jan 2011 – seriously, have a waffle and chill out! So enjoyed reading almost everyone’s comments. Norweigans a proud people and love to share good company and good food with others. I miss it so. Want to go back for a visit again soon. Hi, I found a very old cast iron waffle iron at a yard sale that looks just like my krumkake iron with the ring that goes on the stove. My question is, do I cook them the same as krumkake? and at what heat? I am excited to try it out! You know, because I have an electric heart waffle iron, I’ve never tried one of the old cast iron kinds, so I don’t quite know how you would use it. I do imagine that it would be quite similar to the krumkake ones, where you put it over the heat and flip it after a certain amount of time, and I would probably use medium heat – at least to start – and then adjust up or down as you get the hang of it. And makes sure it’s hot before you put anything in it, and then grease it really well so the waffles don’t get stuck!! Hey all you Waffle fans. Over the past year I have made many batches of waffles. I have add more or less salt, sugar, baking powder etc. The trick I like the best is mixing the milk with some whipping cream. You are currently reading Norwegian Heart Shaped Waffles (Vafler) at Five And Spice.